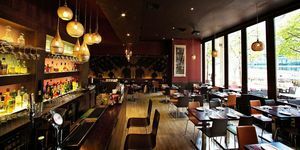 "Fine dining in the heart of Bloomsbury The Blue Door Bistro provides a welcoming and informal bistro-style setting, with a superb à la carte menu to match. 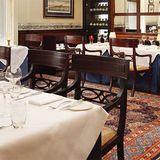 Light and airy at lunchtime, warm and cosy by evening, the room is decorated on three sides with a panoramic view of London circa 1849. Together with the rich mahogany paneled walls, effective use of mirrored glass, and contemporary wrought iron wall lights, an ambience rooted in the hotel’s location is beautifully achieved. Classic seasonal ingredients Executive chef, Martin Halls, blends the freshest of seasonal ingredients and herbs from our herb garden with classical preparation techniques to create wonderful seasonal British menus. 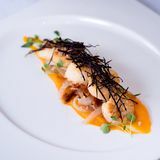 The dishes you'll find are combined with the influence of Beatrice Tollman, President and Founder of the Red Carnation Hotel Collection. Beatrice has a particular passion for food and entrusts her famous signature dishes to Martin. 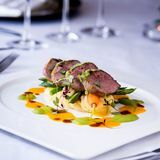 Our cuisine is commended with an AA rosette and we are accredited by the Sustainable Restaurant Association with 2 stars so you can always rely on responsibly sourced food and impeccable service. We make every effort to avoid using any genetically modified foods and insist on only the freshest of ingredients. In all of our products, we only use free range eggs and are committed to sustainable fisheries for our fish supplies. 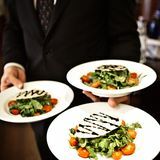 Our team are trained to ensure that your specific dietary requirements are catered for at all times." By sending this booking your details will only be sent to Blue Door Bistro and will never be shared with other third parties. By clicking this box you agree to the Terms and Conditions set out above. You can book to reserve an area of Blue Door Bistro for you and your friends. Just enter your requirements below to see what they have to offer. What did you think of Blue Door Bistro? The Blue Door Bistro provided us with a wonderful, truly unforgettable dining experience. We went there after a trip to the theatre and were impressed by the beautiful setting and the elegant atmosphere. The food was a real 'melt in the mouth' affair and the staff were superb. I cannot recommend The Blue Door Bistro higly enough. A group of us had XMas menu which looked really good. The starters and desserts were good but the sirloin in the main was a bad cut of meat and was chewy, and the Turkey for the main was a bit dry - really nothing to get excited considering they advertise a AA rosette.When my guests arrived, they were told they could not go to the bar as it was full - it wasn't. We were originally told that we could not book 2 tables of 10 so ended up being only 8. There was only us and a couple in the restaurant! The wine was good but all the 4 staff we dealt with were very rude and pedantic! A will spare you the hassle I was put through before the actual day, being endless emails of confirmation and forms to fill....ABOLUTELY NOT RECOMMENDED!! Whilst surfing the net for restaurants, I found the Blue Door Bistro, and scrolled down to the 'seasonal specials', i spotted their Curry Week in November. I booked a table for two online, received confirmation via email and mobile telephone.Arrived at the Bistro, beautifully lit and glowing with candles, a lovely welcoming feel. It was a Tuesday evening and we have a choice of tables, I opted for one close to the window. I liked the artefacts on the windowsill and the decor.My daughter opted for the three course curry menu at approx £27.50, i opted for the two course menu at £23.50, only because i did not fancy a meat or seafood starter. The spicy beef starter was nice according to my daughter, not spicy enough for her but it was tender and tasty. A selection of bread was offered, i opted for the raisin bread, Iwas given one slice, no request as to me if i wanted any more was made. The butter, and three types of sea salt was placed on a lovely glass rectangular dish.I enjoyed my chicken curry, the flaked almonds and tomato relish was fantastic, the balsamic vinegar boosted the tastebuds. The basmati rice was perfectly cooked. The circular naan bread was delicious . My daughter opted for the lamb curry, I sampled a small portion and itwas tender, and well cooked, but not spicy enough, for me a 'hot' chilli lover.The desert were astonishing, i had the ice cream - three different flavours served on three spoon dishes, the passionfruit and the honeycomb was simply out of this world. My daughter had a chocolate cake/souffle with macedonia nuts and icecream it looked scrumptious, but the cake was very rich, and not enough room to eat the lot, i sampled a small piece and it was delicious, but i am, not a chocoholic.The service was good and professional, it was not very busy, so in a way we had a very personal one to one service. candle on the table went out, pity it was not relit. I enjoyed the Blue Door Bistro experience! Will go back.